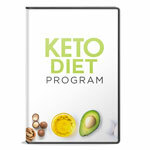 Dr. Axe teaches in this program DVD how the Keto Diet results in positive changes that go far beyond weight loss and has the potential to change your life forever. Transform your body, boost nutritional needs, boost your brain health and tap into your body’s innate ability to burn fat as fuel. 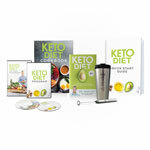 - Coffee & Shake Travel Mug & Frother Kit: Stainless steel 16 oz travel mugwith a guide to mixing Keto Coffee or a Keto Shake printed right on the side. The handy little Frother really packs a punch! With a 12,000 rpm motor- this hand-held milk frother can produce the thickest, foamiest drink in seconds. Sleek, cordless design and convenient one-touch operation.